Some people think Richie Valens played Sleep Walk! 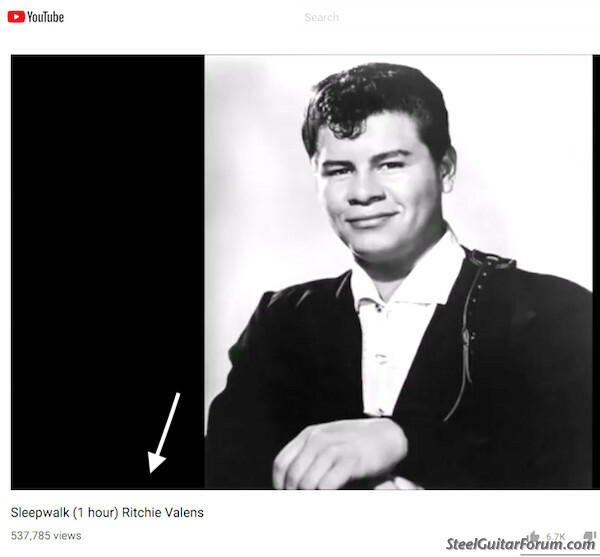 Topic: Some people think Richie Valens played Sleep Walk! Lately I've been getting a lot of comments on my youtube video of Sleep Walk. A few people have said things like: "RITCHIE!!!" and "I love this song, God Bless Ritchie Valens!!!" I was puzzled by this, so I did a little research and discovered that Sleep Walk played at the end of the movie "La Bamba". So a lot of people assume it's a Ritchie Valens song. Of course the song was written and recorded by Santo & Johnny in September, 1959. Ritchie Valens died earlier that year. I have made it my mission to inform and correct every incorrect commenter! We must not allow steel guitar history to be rewritten! As I recall, Richie's bereaved mother in the movie cries out "Richieee" as the song is playing. I think the majority of people are just recalling an iconic film moment but, as happens on the internet, other people make incorrect assumptions about authorship, etc. Good luck in your quest Doug! That explains a lot, Bill, but I still get the impression that some people attribute the song to Ritchie Valens. This does point to something you see a lot in the comments section. For instance younger people (I assume)will associate songs with tv shows or movies. Look up something like Baby Blue by Badfinger and most of the comments will be about Breaking Bad, or Go All The Way by the Raspberries you will see a lot of "Guardians of the Galaxy brought me here". It makes me glad to be an old guy who enjoyed these when they were on the radio before they became associated with videos or movies or commercials. So true. A lot of people think the song Unchained Melody was written for the movie “Ghost”. It was a hit song in the 1960s and was written and first recorded in the 50s. I'm with you Doug - I correct people at every opportunity. But I'm afraid, I think it's a losing battle. I've had a few people compliment me on the Ritchie Valen's song when we played Sleep Walk... also people request "Sleepwalkers"..
Posted 14 Aug 2018 6:54 am Re: Some people think Richie Valens played Sleep Walk! Lately I've been getting a lot of comments on my youtube video of Sleep Walk. A few people have said things like: "RITCHIE!!!" and "I love this song, God Bless Ritchie Valens!!!" I was puzzled by this, so I did a little research and discovered that Sleep Walk played at the end of the movie "La Bamba". if I recall they used "Sleepwalk" several times, as part of the air crash foreshadowing. I think you hear "Sleepwalk" more than "La Bamba" in the movie. Personally, I don't care where they hear Sleep Walk, as long as they hear it. It's my favorite song. Yes, Sleep Walk was again given a boost by it being featured in the movie "Sleepwalkers" (1992). No doubt also being a connection. I clearly remember Sleep Walk being used in the commercial for the (then new) Mazda Miata in between those two films. Sleep Walk had a real revival in popularity. One of those things everybody likes. That brings back a memory... back in 1992 I was playing with a band that would introduce the song as "Sleepwalker" every time I played it. I tried correcting them, but they kept calling it Sleepwalker. Now I know why! Maybe he meant that song about Richie in heaven? Someone on a guitar forum said it's by Santos and Johnnie. back in 1992 I was playing with a band that would introduce the song as "Sleepwalker" every time I played it. I think the most important thing is mentioning the fact its steel guitar. As most people heard the sound but never heard of the instrument. Was watching some romantic comedies with my lady and even TV series on Netflix and both had in Steel Guitar funny thing is in the romantic comedy you could hear steel guitar while a band is playing on a stage without one, Ryan Adams. So don't forget to mention the instrument every time you educate about song history I always do. Yikes! Andy, you made me spill my morning coffee! Here's a good example of how music history can be forgotten or rewritten over the years. I ran across this YouTube video today. A one hour loop of Sleep Walk by... Richie Valens? The video has over a half Million views. The comments are interesting. Most of the commenters don't have a clue. A couple of people mentioned that Santo & Johnny played the song, but someone said Richie's version is better. Someone else said that Santo and Johnny were a Mexican duo. Maybe 50 years from now people will think it's a Beatles song! You know, the band from Ireland with a drummer named Jango Starr. They were big in the 1940s. The video has over a half Million views. The comments are interesting. Most of the commenters don't have a clue. A couple of people mentioned that Santo & Johnny played the song, but someone said Richie's version is better. Someone else said that Santo and Johnny were a Mexican duo. Maybe 50 years from now people will think it's a Beatles song! You know, the band from Ireland with a drummer named Jango Starr. They were big in the 1940s. Just looked through the comments on that thread. Lots of comments about the emotional impact of the recording and how powerful it is----but I didn't see anyone even imply that the instrument had anything to do with that. More likely they would claim they are affected because the song makes them think about Valens and the movie. I assume 90 plus percent of listeners world wide could not name the instrument if they saw a picture of it. I guess a lot of people think it's a standard guitar they are hearing? Weird? I don't know. I wonder what would have become of the song if Santo had taken up the tuba. As for the attribution to Valens---just another confirmation about the state of the culture. I could tell you a long story about librarians with Masters degrees being unaware that New Mexico is one of the 50 states, but I'll refrain as my blood pressure rises whenever I think about it. I know what you mean, Mitch. There has been a dumbing down of our culture in terms of history, geography, and other areas. I've met people who think Toronto is a USA city. I know a senior in college who cannot read cursive handwriting. And a recent survey showed that 1/3 of the respondents didn't know what century the American Revolution occurred in. As far as the steel guitar, a lot of the commenters on my videos ask "what instrument is that?" The other day a guy said the steel guitar was around in the 1960s, but it never caught on! On the other hand, guys... One of my guitar students has a 14-year-old granddaughter who is in an all teenage girl bluegrass band that just released their first CD, and it’s pretty good. She wants to play jazz and integrate that into the band. So there is hope. But you have to feel a little sorry for those few who are clinging to a life raft of intelligence, floating on the ocean of stupid this world is becoming.